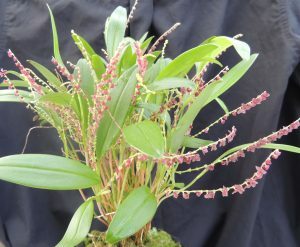 This Stelis species is endemic to Ecuador where it grows in cloud forests at around 1900m. It lives up to its name and produces a mass of upright flower spikes covered in small pinky brown flowers. the flowers are only about 3-4mm across but the mass of flowers give a very attractive display. We find the species vigorous and easy to propagate by division and a very rewarding little species to brighten up the winter greenhouse.